A best example of Nature Bounty with great scenic charm, Rich Biodiversity and providing veritable visiting satisfaction can be seen in Periyar National Park, Thekkady. The park is situated in the state of Kerala covering an area of 925 Sq .km., and is one of the tiger reserve in India. The park reserves the rare, endemic and endangered flora and fauna and makes the watershed of two rivers, the Periyar and Pamba of Kerala. 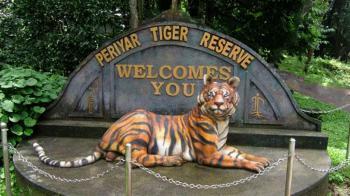 Periyar Nationa Park and Wildlife Sanctuary (PNP), is a protected area in the different districts in Kerala, India. The park is located high in Cardamom and Pandalam Hills. In the Year 1934, the first official action was taken by the Maharaja of Travancore towards the conservation of Biodiversity and Wildlife by declaring the forest around the periyar as the private game reserve. Later it was founded as Nellikkampatty Game Reserve. Some other peaks within the park are Pachayarmala, Vellimala, Sunderamala, Chokkampetti mala and Karimala. The park consist of Tropical Evergreen and Moist Decidious Forest, Grasslands, Lakes and River ecosystem. Hundreds of flowering plant including 171 species of grass and 140 species of orchids are present in the park. The Park contains trees like Teak, Sandalwood, Rosewood, Terminalias, Kino Tree, Jamun, Bamboos and many more. 35 species of the mammals are recorded in the park. Some of them are : Sambar, Wild Pig, Gaur, Jungle Cat, Mongoose, Sloth Bear etc. 266 species of birds are seen in the park which are ; Black Baza, Great Hornbill, Blue Winged Parakeet, Nilgiri Wood, Little Spiderhunter etc. 1895 : Mullaperiyar Dam construction. 1899 : Periyar Lake Rservation formation. 1950 : Periyar consolation as a Wildlife Sanctuary. 1978 : Declaring Periyar Park as the tiger reserve. 1982 : Notification of the core area as a National Park. 1991 : Park bought under the Elephant Project. 2004 : Periyar Foundation was formed. 2011 : The management has been accessed as "very good" by the National Tiger Conservation Authority(NTCA). The best time to visit Periyar National Park is from October - June. Depending upon the altitude the temperature ranges from 15 °C in December and January to 31 °C in April and May. General Timing : 6:00 am - 7:00 pm everyday. Guided Nautre Walk : 7:00 am - 10:00 am and 2:00pm - 5:00pm. Bamboo Rafting : 8:00am - 5:00pm. Boat Safari : 7:30am - 9:30am , 9:30am - 11:30am , 11:45am - 1:45pm, 1:45pm - 3:30pm. For Forigner : Rs 450. For Indian : Rs 50. Video Camera : Rs 300. Still Camera : Rs 40. Boat Safari : Rs 150. By Air : Madurai Airport is the nearest airport from Periyar. By Rail : Kottayam Railway Station is the closest station to Periyar. By Road : Nearest town Kumli is well served by the state and private buses from Kottayam, Ernakulam.